This article is about the size criteria for ships travelling through the Panama Canal. For the medicine named "Panamax", see Paracetamol. Two ships seen almost touching the walls of the Miraflores Locks. An officer monitors the clearance of the cruise ship Ryndam as she traverses the lock. USS Missouri, one of the Iowa-class battleships, makes a very tight fit as she passes through the Miraflores Locks of the Panama Canal in October 1945. Panamax is determined principally by the dimensions of the canal's original lock chambers, each of which is 110 ft (33.53 m) wide, 1,050 ft (320.04 m) long, and 41.2 ft (12.56 m) deep. The usable length of each lock chamber is 1,000 ft (304.8 m). The available water depth in the lock chambers varies, but the shallowest depth is at the south sill of the Pedro Miguel Locks and is 41.2 ft (12.56 m) at a Miraflores Lake level of 54 ft 6 in (16.61 m). The clearance under the Bridge of the Americas at Balboa is the limiting factor on a vessel's overall height for both Panamax and Neopanamax ships; the exact figure depends on the water level. New Panamax increases allowable length to 366 m (1,201 ft). Width over outer surface of the shell plating: 106 ft (32.31 m). General exception: 107 ft (32.61 m), when draft is less than 37 ft (11.3 m) in tropical fresh water. New Panamax increases allowable width to 49 m (161 ft). The maximum allowable draft is 39.5 ft (12.04 m) in Tropical Fresh Water (TFW). The name and definition of TFW is created by ACP using the freshwater Lake Gatún as a reference, since this is the determination of the maximum draft. The salinity and temperature of water affect its density, and hence how deep a ship will float in the water. Tropical Fresh Water (TFW) is fresh water of Lake Gatún, with density 0.9954 g/cm3, at 29.1 °C (84 °F). The physical limit is set by the lower (seaside) entrance of the Pedro Miguel locks. When the water level in Lake Gatún is low during an exceptionally dry season the maximum permitted draft may be reduced. Such a restriction is published three weeks in advance, so ship loading plans can take appropriate measures. New Panamax increases allowable draft to 15.2 m (49.9 ft), however due to low rainfall, the canal authority limited draft to 43 feet when the new locks opened in June 2016, increasing it to 44 feet (13.41 meters), in August "based on the current level of Gatun Lake and the weather forecast for the following weeks." Vessel height is limited to 190 ft (57.91 m) measured from the waterline to the vessel's highest point; the limit also pertains to New Panamax in order to pass under the Bridge of the Americas at Balboa harbor. Exception: 205 ft (62.5 m) when passage at low water (MLWS) at Balboa is possible. All exceptions are typically allowed only after specific request and an investigation, and on a once- or twice-only basis. A Panamax cargo ship would typically have a DWT of 65,000–80,000 tonnes, but its maximum cargo would be about 52,500 tonnes during a transit due to draft limitations in the canal. New Panamax ships can carry 120,000 DWT. Panamax container ships can carry 5,000 twenty-foot equivalent units (TEU); with 13,000 TEU for New Panamax vessels. The longest ship ever to transit the original locks was San Juan Prospector, now Marcona Prospector, an ore-bulk-oil carrier that is 973 ft (296.57 m) long, with a beam of 106 ft (32.31 m). The widest ships to transit are the four Iowa-class battleships (Iowa, New Jersey, Missouri, and Wisconsin), which have a maximum beam of 108 ft (33 m), leaving less than 6 in (15 cm) margin of error between the ships and the walls of the locks. As early as the 1930s, new locks were proposed for the Panama Canal to ease congestion and to allow larger ships to pass. The project was abandoned in 1942. On October 22, 2006, the Panama Canal Authority (with the support of the Electoral Tribunal) held a referendum for Panamanian citizens to vote on the Panama Canal expansion project. The expansion was approved by a wide margin, with support from about 78% of the electorate. Construction began in 2007, and after several delays, the new locks opened for commercial traffic on 26 June 2016. The plans to build another set of larger locks led to the creation of the Neopanamax or New Panamax ship classification, based on the new locks' dimensions of 427 m (1,401 ft) in length, 55 m (180 ft) in beam, and 18.3 m (60.0 ft) in depth. Naval architects and civil engineers began taking into account these dimensions for container ships. With the new locks, the Panama Canal is able to handle vessels with overall length of 366 m (1201 feet), 49 meters beam and 15.2 meters draft. and cargo capacity up to 14,000 twenty-foot equivalent units (TEU); previously, it could only handle vessels up to about 5,000 TEU. The Neopanamax standard accommodates ships up to 120,000 DWT. Navigational clearance under the Bayonne Bridge in New York harbor was increased to accommodate New Panamax ships by building a new, higher roadway inside the arch and then removing the lower roadway. Bayonne Bridge with old roadway removed over the water. Several ports, including the ports of New York and New Jersey, Norfolk, and Baltimore, all on the East Coast of the United States, have already increased their depth to at least 50 feet (15 m) to accommodate New Panamax ships; in 2015 the Port of Miami achieved the same in a project known as the "Deep Dredge" and is the closest deep-water port to the Panama Canal in the US. Liverpool built a new container terminal, Liverpool2, where ships berth in the tidal river rather than in the enclosed docks, coinciding with the opening of the widened Panama Canal locks. In Halifax a major expansion of the South End Container Terminal was completed in 2012, extending the pier and increasing the berth depth from 14.5 to 16 metres (48 to 52 ft). In 2017, the Port Authority of New York and New Jersey raised the clearance of the Bayonne Bridge to 215 feet (66 m), at a cost of $1.7 billion, to allow New Panamax ships to reach container port facilities at Port Newark–Elizabeth Marine Terminal. Previously, only GCT Bayonne, Global Container, could handle the New Panamax ships. As of April 2012, a controversy between Savannah, Georgia, and Charleston, South Carolina, over limited federal funding for dredging/deepening projects—including both state and federal lawsuits filed by environmental groups in both states opposing the techniques planned to be used in dredging the Savannah River—also revolves around attracting the business of carriers whose fleets include New Panamax vessels. Jacksonville, Florida, is pursuing its "Mile Point" project with the prospect of deepening the St. John's River in anticipation of Post-Panamax traffic; Mobile, Alabama, has completed the deepening of its harbor to 45 feet (14 m) for the same reason; and other ports seem likely to follow suit. Due to the expansion, demand for 'Old Panamax' ships has plummetted, resulting in ships being traded at scrap value. Some ships only 7 years old have been sold for scrap. Post-Panamax or over-Panamax denote ships larger than Panamax that do not fit in the original canal locks, such as supertankers and the largest modern container and passenger ships. The first known post-Panamax ship was the RMS Queen Mary, launched in 1934, built with a 118-foot beam as she was intended solely for North Atlantic passenger runs. When she was moved to Long Beach, California, as a tourist attraction in 1967, a lengthy voyage around Cape Horn was necessary. The first post-Panamax warships were the Japanese Yamato-class battleships, launched in 1940. Until World War II, the United States Navy required that all of their warships be capable of transiting the Panama Canal. The first US Navy warship design to exceed Panamax limits was the Montana-class battleship, designed circa 1940 but never built. 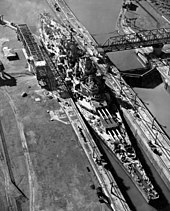 The limit was specifically removed by the Secretary of the Navy on 12 February 1940, with the (never-realized) prospect of a new set of 140-foot wide locks to be built for the Canal. The Essex-class aircraft carriers were designed with a folding deck-edge elevator to meet Panamax limits; the limit did not apply to subsequent US aircraft carriers. ^ a b "Vessel Requirements" (PDF). Panama Canal Authority. ^ a b c d e f g Manuel E. Benítez, ACP (2009-01-19). "Dimensions for Future Lock Chambers and "New Panamax" Vessels" (PDF). ACP. Retrieved 2010-05-02. ^ "Regulation on navigation in Panama Canal Waters" (PDF). The Panama Canal Authority. 1999-06-03. p. 10. Retrieved 2012-12-10. ^ Modern ship size definitions (PDF), Lloyd's register, archived from the original (PDF) on 2012-02-04 . ^ a b "The New Panamax; 13,200-TEU Containership, 120,000 dwt Bulk Carrier". Retrieved 4 January 2014. ^ "BB-61 Iowa-class". Retrieved 4 January 2014. ^ "Panama Canal Opens $5B Locks, Bullish Despite Shipping Woes". The New York Times. Associated Press. 2016-06-26. Retrieved 2016-06-26. ^ Propulsion Trends in Container Vessels (PDF), MAN B&W Two-stroke Engines . ^ "Panama canal expansion, reordering maritime trade". CMA CGA. Retrieved 9 October 2017. ^ "'Maersk Djibouti' 5,000 TEU container ship", Fleet (PDF), Rickmers Maritime [permanent dead link]. ^ "Bill Johnson, Director of the Port of Miami, presented on the Port of Miami's Deep Dredge Project to the Miami Beach Chamber of Commerce's…". Retrieved 4 January 2014. ^ Power, Bill (13 February 2012). "$35m port terminal project nearing completion". Halifax Chronicle-Herald. ^ "Navigational Clearance Project - Bayonne Bridge - The Port Authority of NY & NJ". www.panynj.gov. ^ Robertson, Jamie (1 March 2017). "Why a ship worth $60m was sold as scrap" – via www.bbc.co.uk. ^ "Maersk scrapping eight Panamax ships". www.joc.com. ^ Tramp to Queen: The Autobiography of Captain John Treasure Jones. The History Press. 2008. ISBN 0752446258. ^ "Yamato Class Battleship – Japan (Pacific 1940)". Retrieved 4 January 2014. ^ Friedman, Norman (1985). U.S. Battleships: An Illustrated Design History. Annapolis, Maryland: Naval Institute Press. p. 332. ISBN 978-0-87021-715-9. ^ "70 years of schemes to improve and enlarge the Panama Canal", p. 1 (Essex-class aircraft carriers were the "last fleet carriers capable of passing through the canal’s original locks"). The paper is linked from Dr. Roger's website, Panama Canal.